Lake Homes Realty’s brokerage operations are rapidly expanding into new states across the U.S., but the company’s market footprint isn’t the only thing that has grown. Not only did the company add brokerage operations in seven more states in 2017, they added more members to their corporate and operations teams. All this growth prompted a move this month from their Pelham, Alabama office to a multi-tenant building in nearby Hoover. 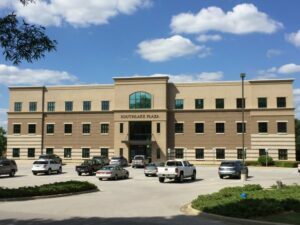 The corporate and central brokerage operations offices for Lake Homes Realty are now at Hoover’s South Lake Plaza, an appropriate location for the nation’s largest lake real estate company. Currently the brokerage occupies space on two floors of the three-story office complex. The firm’s marketing and technology teams are located on the first floor of the building, and the brokerage operations team occupies much of the second floor. Southlake Plaza is owned and managed by the Barber Companies, Inc. of Birmingham. Weyman Prater represented the Barber Companies in the lease negotiations, and Anita Turner of Colliers International provided tenant representation. “Candidly, our goal each year will be to grow enough that we acquire more office space within the building. This will be needed as we enter more markets across the U.S. and grow our staff,” Phillips explained. The Lake Homes Realty CEO added that availability of office space and increasing business demands also means new opportunities for employment within the operations, marketing and engineering departments are on the horizon. 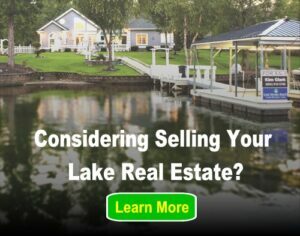 The company’s unique and highly virtual operations model starts with a focus on a one-stop website for lake homes and land, via the company website, LakeHomes.com. The technology is paired with the brokerage’s own select group of top-producing expert lake market agents. The company has rejected a focus on traditional brick-and-mortar opting to focus more spending on marketing properties and bringing new convenience to buyers and sellers. Lake Homes Realty was named #927 on the 2017 Inc 5,000 and was recently featured by Realtor® Magazine. The Birmingham Business Journal has also named Lake Homes Realty one of the 30 fastest growing businesses in Birmingham each of the past three years.